A package of 10 pcs. costs 1120 USD. 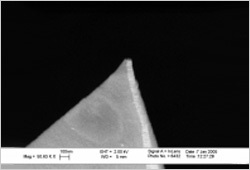 The SC-20-LM is similar to the SC-35-LM, but to further increase the resolution and decrease the tip field, the coating thickness has been reduced. This is the ideal tip for very sensitive samples, where the magnetic state of the sample can be easily influenced by the tip strayfield.